This place is about 3km away from the northeast of the city center. “Hon Chong” rock is a large population with a variety of shapes, stacked high running from the shore into the sea. A group of smaller stones, located in the foothills to the east, known as “Hon Vo” Hon Chong space almost separated from the space's bustling streets. It is also one of the most beautiful views of the city. 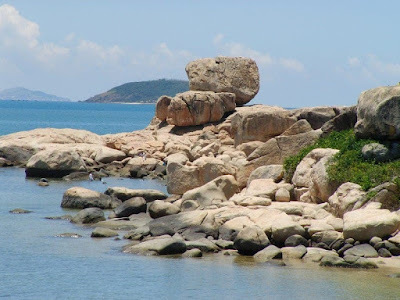 Van Phong Bay is belonging to Van Ninh district (Khanh Hoa), about 40km away from the north of Nha Trang. It attracts visitors with the wild beauty of the populations of small islands and blue in the smaller bays inside. This is a beautiful structure, located in the center of NhaTrang city tour. Dam Market sells a lot of souvenirs and local products. Here the focus is very rich seafood, especially dried seafood.